Carnegie Mellon University has a long history of pursuing HCI research and education. The idea for a Human Computer Interaction Institute can be traced back to 1967, when founders of the computer science program, Allen Newell, Herbert Simon, and Alan Perlis, wrote that the new discipline of computer science should include the study of phenomena surrounding computers, not just the theory and design of computation devices themselves (Letter to Science, 9/22/67). This led to early research in HCI, including doctoral theses by Tom Moran (CS, 1973) and Stu Card (Psychology, 1978), who later wrote The Psychology of Human-Computer Interaction, with Allen Newell (1983). By the early 1990s, courses in HCI were offered in three schools in the university: Computer Science, Humanities and Social Science, and the School of Design. In 1994, a committee drawing on faculty across the campus founded the HCI Institute within the School of Computer Science. The professional Masters in HCI (MHCI) followed in 1995, and a doctoral program in HCI began in 2000. 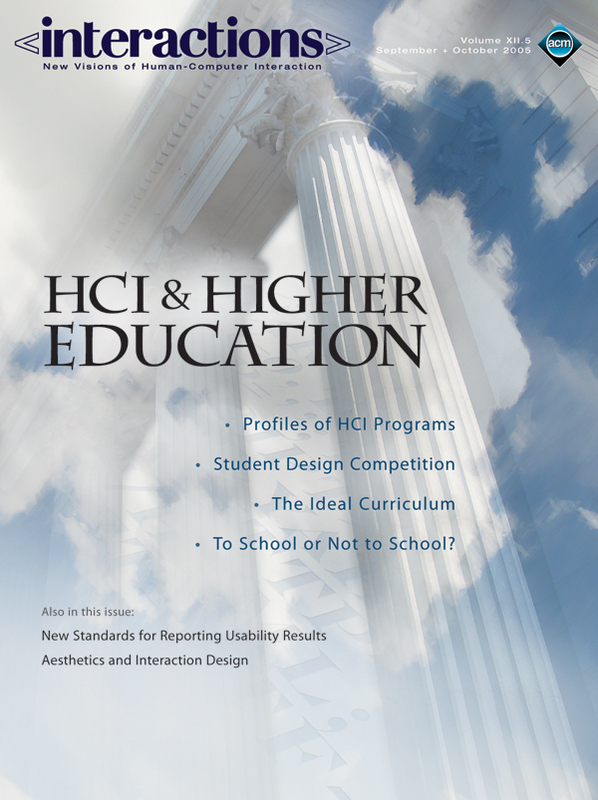 A guiding precept of the HCI Institute is that the best results in interactive system design are obtained through interdisciplinary work, specifically from the disciplines of behavioral science, computer science, and design. We provide each MHCI student a chance to "walk in the shoes" of each of the disciplines to learn to appreciate the skills and sensibilities of them all. Every student practices behavioral skills like ethnologically-inspired field work and think-aloud usability studies, to experience first hand the infinite ingenuity and variety of human behavior that contradict the designer’s intuitions (our mantra is "the user is not like me"). Every student programs, staying up all night to experience the "last bug" phenomenon (i.e., "I found the last bug…. No, it still doesn’t work…. Oh, there it is, I found the last bug… No, it still doesn’t work…"). And every student takes a studio class in Design, puts their work on the wall and endures the crit, the sometimes stinging but always valuable critique of professor and peers. We believe that having such personal experiences during the masters program allows our graduates to work more effectively on interdisciplinary teams in industry. Our precept also appears as an emphasis on group work. The HCI methods required course contains several group assignments and a laboratory component where students work in small groups to provide HCI input into interactive system designs going on across the university. Recent years have included lab projects on interaction with a robot nurse, a system for conducting virtual town hall meetings during the presidential campaign, and a tutoring system for legal argumentation. Elective classes include Rapid Prototyping, where a large group (up to 70 students) from all engineering, behavioral, and design disciplines, organize to design and build an entire computer system, from hardware to software to documentation, in three months. Building Virtual Worlds rotates students through three-person teams that include artists, dramatists, computer scientists, and storytellers, to build half a dozen virtual worlds in one semester. The MHCI culminates in a capstone project, running from January until August, where a group of four or five MHCI students takes an open-ended project from an external client, investigates the needs of the target users, and produces a fully functional prototype, often iterating through as many as seven or eight prototypes along the way. Some capstone projects have included a heads-up navigation system for General Motors, niche calculators for Texas Instruments, and a human-robot interaction system for NASA. Finally, we are continually improving our MHCI program through user-centered design of the program itself. Our "users" include the industries that employ our graduates, the students themselves, and our alumni. Employers value the MHCI’s emphasis on group work and, in particular, the extended duration, full-time hours, and minimal supervision, associated with the capstone project. Since our students come from all educational and industrial backgrounds, no one course of study will fit all student needs. The MHCI program includes six electives that are hand-picked from all courses in the university, through negotiation between each student and the director of the program, to fill gaps and expand interests. Independent study is a popular option that can give the student a flavor of HCI research. For professional development, we provide a seminar that brings speakers from research and industry to present and attend a dinner with MHCI students. We subsidize each MHCI student to go to the CHI conference, which provides an opportunity to experience the premier conference in our field, job hunting, and networking with our alumni. Finally, our MHCI alumni are spreading to all parts of the interactive system development world, in large industries like Microsoft, IBM, and Google, small industries too numerous to name, government organizations like NASA, and independent consulting. As particularly knowledgeable "users" of the MHCI program, having experienced it as students, alumni, and often employers, they have unique perspectives that we consult to increase the effectiveness of our educational programs and the pleasure of attending the HCI Institute at CMU. Bonnie John is a professor in Carnegie Mellon University’s School of Computer Science and a founding member of the Human-Computer Interaction Institute there. She directs the Masters in HCI Degree Program. She holds a bachelor’s (Cooper Union) and master’s (Standford) in Mechanical Engineering and a PhD in Cognitive Psychology (Carnegie Mellon). She worked in industry as an engineer for five years prior to her PhD and has been faculty at Carnegie Mellon since 1988. Her research interests include computational cognitive modeling and bringing usability concerns to the design of software architecture. She was inducted into the CHI Academy in 2005. The Digital Library is published by the Association for Computing Machinery. Copyright © 2005 ACM, Inc.